Our friend Antonio Zanardo has built a geiger tube in his workshop. It has not been an easy task but he is a stubborn guy and he told us all the steps he followed! 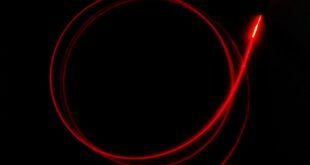 The idea of ​​building a Geiger tube came to me during the construction of some muon detectors (secondary cosmic rays). These instruments made use of certain number of tubes that I bought from Ukraine. Tubes were not always availabl and they are fairly expensive, but above all you have to wait a couple of months for their arrival. These difficulties pushed me to attempt the construction of a prototype of a GM tube, also in consideration of its apparent constructive simplicity. It is not the case to describe all the numberless difficulties I encountered. It was possible to overcome all of them thanks to my stubbornness and to the help many suggestions of Italian and foreign friends. However, these things are not sufficient. 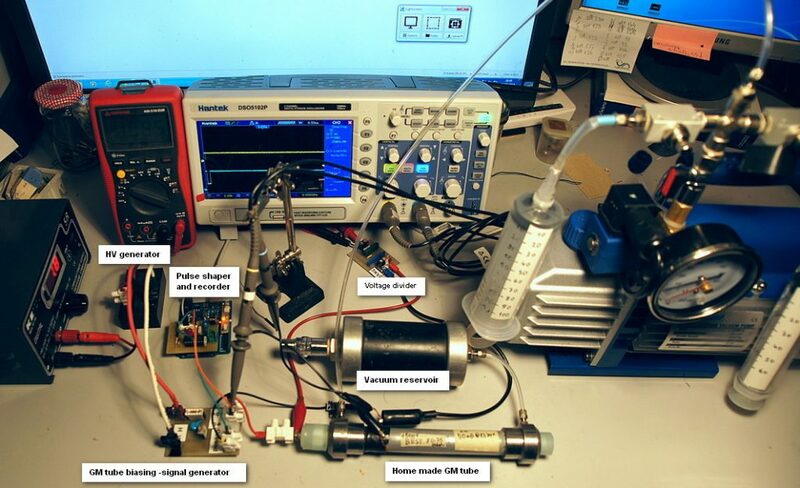 As I proceeded into the project I found that to perform these experiments, two essential technical tools must be available: a double-channel oscilloscope and a vacuum pump. The literature, but also some other “makers”, says that the Geiger tube works even if the filling gas is air at atmospheric pressure. I have tried in every way using an High Voltage power supply that generates variable continuous voltages from 1KV up to 12KV, but I have never been able to notice signals of sensitivity of the tube to any radioactive source. Or maybe, I was not able to distinguish these signals between the amount of discharges that occurred just over the level of rather high voltage (3-4 KV). The breakthrough came when, tired of doing unsuccessful experiments, I filled the tube with a mixture of Argon and Butane gas I made on the basis of some vague memory, ie 80% Argon and 20% butane for lighters. For details, please refer to the paragraph “Gas mixing”. I finally connected one of the two fittings to the pump, leaving the other well plugged, and I started to reduce the pressure. My pump does not have a vacuum switch, so to lower the pressure progressively, you must act with short strokes on the pump switch. At about a pressure of 80 millibars and at a voltage of about 1500V the oscilloscope began to show pulses that varied in frequency when a radioactive source, consisting of a small piece of uraninite with 0.3mR / h. was put at contact to the tube or moved away from it. The signals were even more numerous while using as a radiation source some red-marked thoriad electrodes, the kind normally used in TIG welding processes. It was done. Finally I was sure that the tube was working ! Congratulations to Antonio for this realization and let’s describe some technical details. The tube has an outer diameter of 21 mm, the wall thickness is 0.5 mm and is 150 mm long, the material is Fe. It was obtained by sectioning a metal tube. At the two ends the tube is closed by two plugs. Each of these is also made from Fe worked on the lathe, radially carries a gas inlet fitting and axially an M12 hole, used to screw in the insulator that supports the anodic wire. The insulators are also turned on the lathe, the material is PTFE (Teflon), preferred for its high dielectric strength. The two caps are fitted outside the tube (see drawing) and sealed with cyanoacrylic glue or, alternatively, with a product called “liquid teflon”. The anode was made of a 0.2 mm diameter NiCr wire. Tests were also made using copper wire, but this proved to break easily as soon as it was tensioned. Once the whole assembly has been put together, the 0,5 mm small holes of insulators through which the anodic wire passes, were sealed with hot glue. A hot air gun was also used to heat thoroughly the pieces thus allowing the glue to penetrate easily the most minute interstices, perfectly sealing them. Care must be taken to make the tube perfectly airtight. It is obvious that if there is any leak, even a minimal one and difficult to detect, within a few minutes, or at best in few days, the tube would become useless due to the air inlet with the consequent alteration of the internal pressure and of that of the gas features. To this respect, it is important to point out that the relationship between the voltage and the pressure is critical: for example, once set a working voltage, if you just change the pressure by few millibars, you make the Geiger tube either working or not. For the operation of the Geiger tube it is essential to correctly choose the mixture and the pressure of the gas inside the tube. The Geiger tube reacts to radiation because inside it is produced an ionization at the passage of a particle, the high electric field close to the anode manages to separate positive ions from electrons and lead them to the electrodes, producing in turn, by collision, other ions, which finally produce an avalanche discharge. The conditions for the avalanche discharge strongly depend on the gas mixture, on the pressure, and the voltage applied; in addition, the presence of a “quenching” gas is necessary, its function is turning off the discharge so that the tube is ready for the subsequent particle detection. The DIY tube used Argon gas and butane gas as quenching gas. Argon gas is found at some domestic welding machine retailers. It is sold for about 20-25 euros in disposable cylinders with a capacity of about one liter, containing the compressed gas at 60 bar. Therefore, a special pressure reducer is needed, which must however be carefully chosen to run not into certain low quality reducers which have leaks able to empty the cylinder even after a few hours of inactivity. Butane is contained in cans for the refill of cigarette lighters that can be purchased for a few euros at any tobacco shop. The composition of the mixture is made in a large 100 ml syringe. It is connected to the pressure regulator of the argon and partially filled (in this case 80 ml) with this gas. By carefully opening the pressure regulator, the gas enters the syringe and the quantity entered is indicated by the displacement of the piston, exactly as if it were any liquid. Then the syringe should be connected to the butane canister to allow the remaining 20 ml to enter. During the filling, the butane can must be kept vertically with the outlet tube pointing downwards. The whole mixture is then injected into the geiger tube through one of the fittings, leaving the other one temporarily open. The excess volume of the gas contained in the syringe with respect to the capacity of the tube serves to flush the air contained in the tube. The operation is repeated 3-4 times to make sure that there is no longer air in the tube, but only the prepared mixture, taking care that the fittings remain open only for the minimum time necessary to perform the operation. After the filling, one of the two fittings is connected to the pump, leaving the other one well plugged on, and the vacuum starts. To obtain the needed vacuum value, short pulses must be applied to the pump switch. 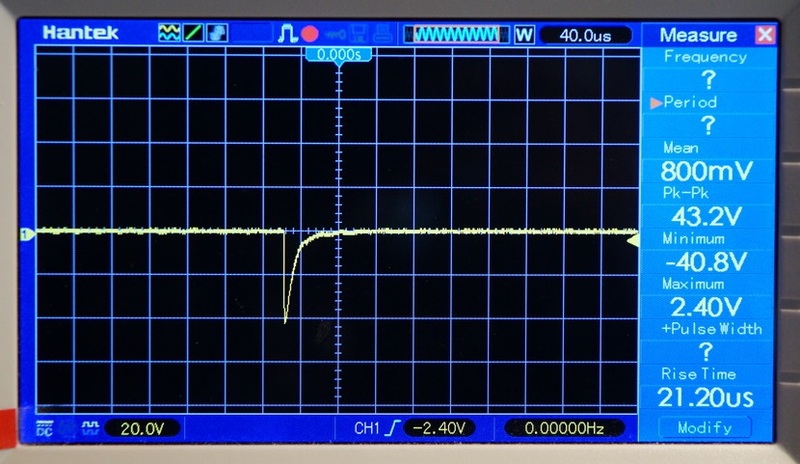 Around a pressure of 80mbar and at a voltage of about 1500V the oscilloscope should start to show signals that vary in frequency when putting a radioactive source close to the tube. I have first described above the first manual method I used to create the gaseous mixture and inject it into the tube. Later on, to make this operation more convenient and practical, a different set up was adopted, as shown in the image below. Finally, since the works never end, a further variant of the vacuum circuit has been put in place so that the gases can be loaded, mixed and injected into the pipe without ever disconnecting any components. The high voltage for the Geiger tube is provided by an EMCO generator. This model, found on Ebay, reaches a maximum of 12KV, but in this case it is used at about 1.2-1.5KV by adjusting the low DC voltage applied to its input. The GM tube is connected to a 10MΩ load resistance. The impulse is taken from a 6.3KV 47pF ceramic capacitor. At this point, if you are satisfied with observing the pulses on the oscilloscope screen, just connect the probe to the aforementioned node, after making sure that, given the tensions involved, it has the ratio 10/1. If, on the other hand, you want to count the impulses and save them for off-line analyzes, it is advisable to “square” and take them to the TTL level. The pulse shaping circuit employs an integrated 74HCI14N consisting of 6 Schmidt Triggers, which must be combined as needed to output a positive squared pulse that can be acquired by a data-logger. The graphs below show the trend of pulse counting as a function of the applied voltage, with sample radioactive source and without sample source (only background). We can see how starting from 1400V the number of pulses remains fairly constant, and then increases beyond 1550V when the continuous discharge area is reached. The area between 1400 and 1550V is known as geiger plateau. The DIY tube has been compared to a commercial tube, the classic Soviet-made SBM19 tube. The DIY tube dimensions are almost identical to those of the Russian SBM19. The Russian tube was kept on for 30 minutes, during which it recorded an average of 112 cpm (background only). Then, for another 30 minutes, it was placed in contact with the uraninite source. In this latter case he recorded 680 cpm, obviously including the background. 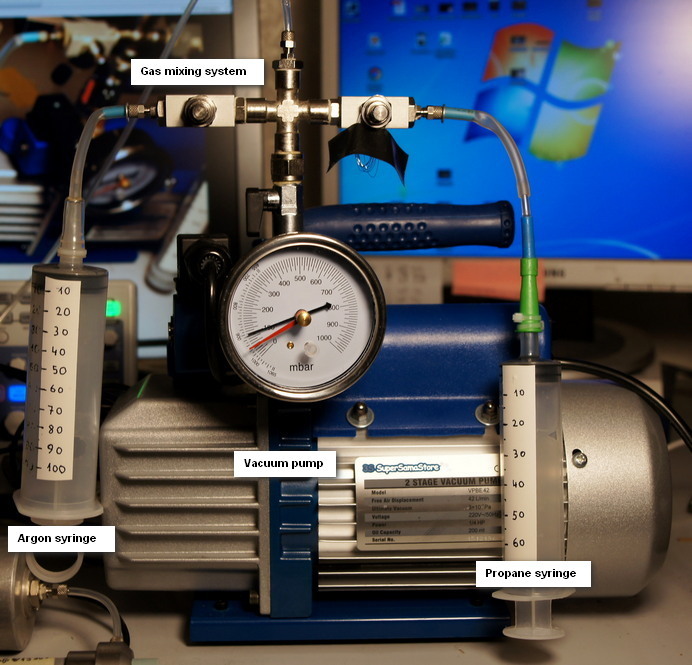 The same test was performed with the self-built tube with the same methods: in the first 30 minutes it recorded 85 cpm. In the second 30 minutes the cpm were 260. 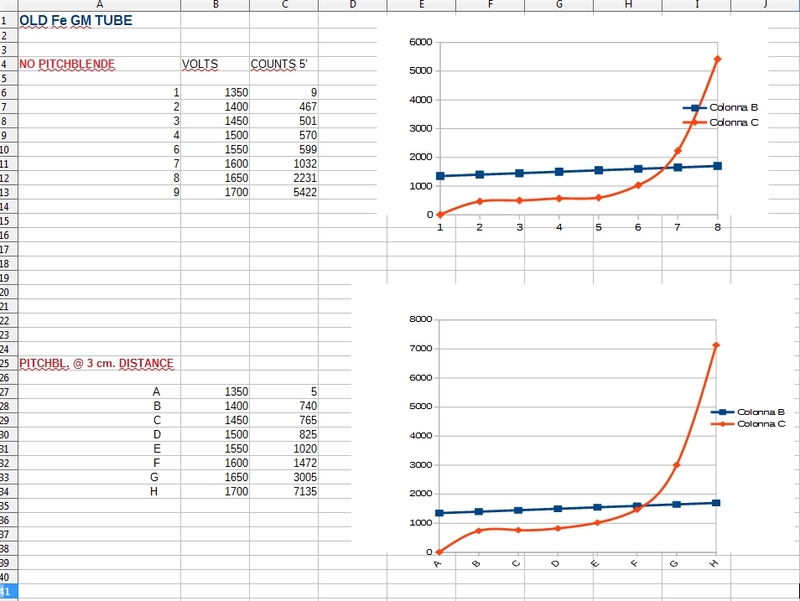 The SBM19 tube showed a ratio 680/112 = 6.07, while the DIY tube shows a ratio 260/85 = 3.05. Therefore we can say that the DIY tube has an efficiency half of the commercial tube. 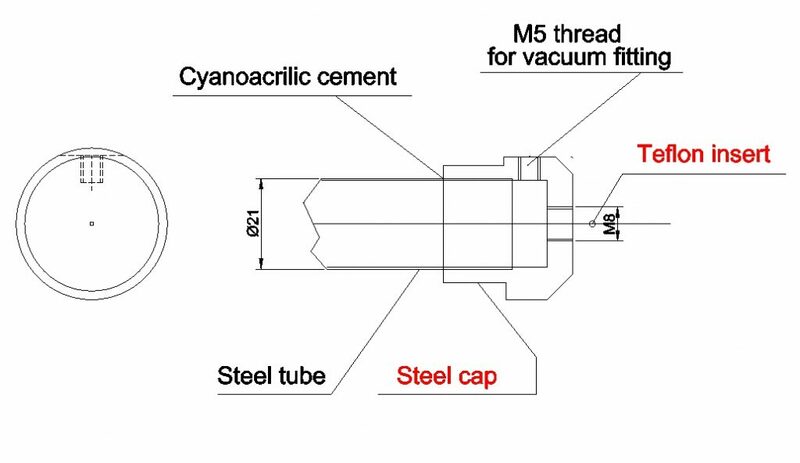 We also take into account that the thickness of the SBM19 tube (cathode) is 0.05 mm (which is why it has various ribs of strength) and is made of stainless steel, while the thickness of the DIY tube is 0.5 mm and it is of normal steel: the greater thickness of the DIY tube certainly has an effect of reducing the sensitivity of the instrument.